For the past several years, I’ve keep a sketchbook that I use for everyday notes, ideas, lists, sketches, as well as travel collages. I carry it with me everywhere and, recently, it has been filling up with new Japanese words I'm learning! Whenever I travel, I add collages of each city I visit. You know all those maps, brochures, and ticket stubs you collect while traveling? I have always hated throwing all that information away; I have this irrational desire to hang on to it all because I'll want to look at it again one day! Of course, I never actually look at it again, so I’ve decided to save some of it in my sketchbooks by cutting it up and making collages. I save all sorts of things to add to the collages; the label off a beer I really enjoyed, a blessing card from a Buddhist temple, a four leaf clover I found along the way, a business card from a particularly fun restaurant, or a train or museum ticket stub. To start the collage, I typically use a map of the city or area as the first layer. Then, I search through the brochures and find images that remind me of our trip -- places we visited, a restaurant we ate at, or a view we saw. I cut those out, then arrange all that with the other little scraps of this and that until it works. I finish it off by writing the city name and date, so I'll never forget! Since I started doing these collages several years ago, I always pack a pair of scissors (the small, childrens' type) and double-sided tape in my luggage. 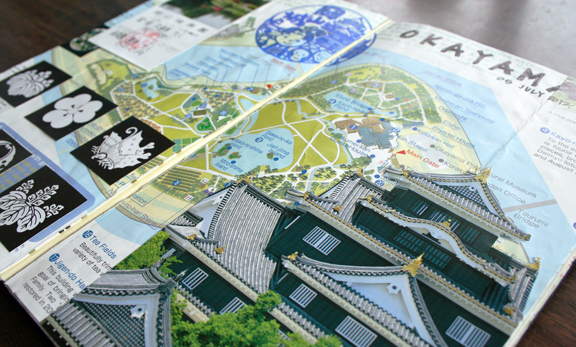 Then, on a long car or train ride, I can make the collage and unload all those unnecessary brochures. Between sketching and collaging, I'm sure my collection of black Moleskine notebooks will continue to grow. Filled with good memories, preserved for the future.